The beauty industry is always looking to provide new, innovative products. These days a lot of women are busier, have less time and want good quality products. The latest launch from luxury self-tan brand Vita Liberata promises to be an immovative multi-tasker, as it is the first self-tanning bronzer. 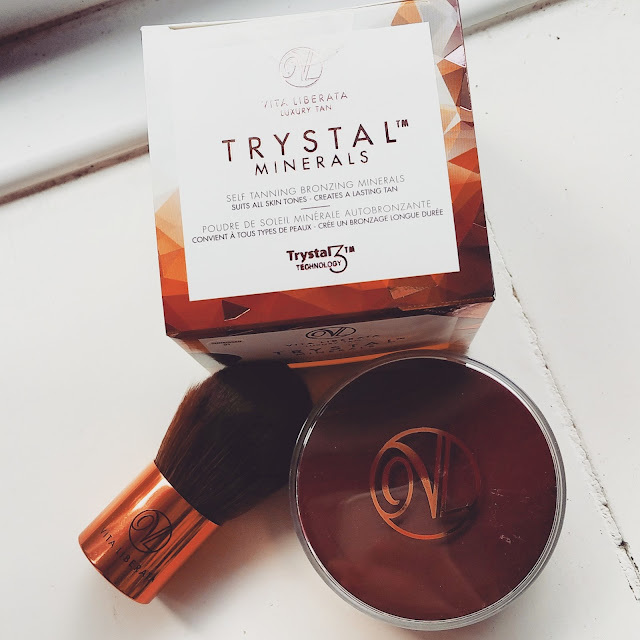 Trystal Minerals is a mineral bronzing powder that doubles a self-tanner, building up a gradual tan with each use. The DHA tanning agent in Trystal Minerals reacts with skin when applied over moisturiser or foundation - ideal for paler girls that don't like to use self tan, or to top up self tan in between applications. Available in two shades, Sunkissed and Bronze, the product comes with a specially designed kabuki brush for application. Packaging: At a first glance I was very impressed with the packaging. It is simple but of a high quality. The included brush is extremely soft (always a bonus!) and the pot of minerals is very sturdy and distributes an even amount of powder when you tip it out. Experience: As a bronzer, I love this. I use it all over the face to give my skin a warm glow, and as a separate contour. However, in terms of it building up a natural tan, I haven't noticed any results. I use it daily but it hasn't build up much of a tan on my face unfortunately. After a bit of research I have found out that the tanning agents are meant to work best when the bronzer is applied over moisturiser, rather than foundation, so this could be a reason, but for me I much prefer this as a bronzer rather than a self tanner. I'm really pleased I tried this and it has lasted me for months, but with a £35 price tag I don't think it lives up to its hype! Seems a bit of an odd concept...I'd be scared it would be blotchy as you don't put bronzer all over your face. But I'm glad its working for you as just a bronzer!